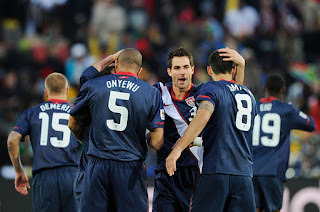 United States Men’s National Team manager Jurgen Klinsmann has announced his squad for this week’s upcoming friendlies against Honduras and Ecuador and has recalled center back Oguchi Onyewu to the squad after he had been left out of Klinsmann’s previous selections. Other new arrivals in the squad are Nick Rimando, goalkeeper for Real Salt Lake, and Danny Williams, the German-born Hoffenheim midfielder who just acquired his American passport this past Friday. These three new additions to Klinsmann’s squad are joined by regulars Jozy Altidore, Steve Cherundolo, Tim Howard, Clint Dempsey, Carlos Bocanegra, and Michael Bradley. Landon Donovan was also called up to the squad, but his lingering quad strain has forced Klinsmann to call up striker Edson Buddle as his replacement. These regulars are still looking for their first win under Klinsmann, who in his first three matches earned two draws and a loss to Belgium in three friendlies. Juan Agudelo, Brek Shea, Timmy Chandler, and Teal Bunbury are all included in the squad, giving it the look towards the future that Klinsmann has spoken about since entering as manager. Bunbury is currently on a good run of form, scoring 3 goals in his last 4 matches for Kansas City. Timmy Chandler has been a constant presence for FC Nuremburg, who currently sit mid-table in the Bundesliga. Agudelo and Shea have both struggled for their respective MLS clubs as of late and will hopefully be rejuvenated by the return to the USMNT setup. This week Klinsmann also won another battle for a dual-nationality player, with Hoffenheim midfielder Fabian Johnson’s switch from the German youth system to the USMNT being approved by FIFA. Johnson had 20 caps at the U-19 – U-21 levels for Germany, but chose to play for the United States. Despite approval being granted by FIFA, Johnson will not feature in this week’s matches due to being sidelined with a neck injury. The main story from this squad announcement is Onyewu’s return to the squad. After Klinsmann seemed to use his first few matches to search for depth and improved ball playing from the back, he has returned to Bob Bradley’s choice at center back. Onyewu is a decent defender overall, he uses his body well, but his lack of speed and acceleration leave him out of position at times against quicker strikers. He also struggles in contributing anything to build up play and his passing play from the back does not seem likely to improve. After difficult spells with AC Milan and FC Twente, Gooch made his way to Sporting Lisbon this season and has enjoyed a good run so far and even earned a goal. You can hardly blame Onyewu for the move to Milan, despite it stalling his career, but hopefully he will be able to continue his career revitalization with the USMNT this week. Also looking to rebuild his career is Demarcus Beasley, who recently moved to Mexican side Puebla after an unsuccessful spell at Hannover. Also included in the squad is Kyle Beckerman, who is enjoying a good season with Real Salt Lake. Beckerman was involved in an incident last week where he leveled Daniel Paladini with a vicious, dreadlocked, headbutt. Overall, American fans can be happy with the side selected. The squad will lack some star power without the presence of Landon Donovan, but this squad should be more than enough to get wins from Honduras and Ecuador. If they do not, then it may be time for fans to panic.